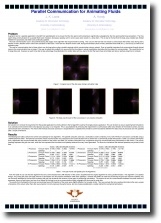 A parallelisation of a generic fluid solver is given in this poster. As the standard parallelisation communicates many times per iteration of the fluid solver and even many times per iteration of the iterative solver, a method of reducing communication is needed. With this in mind a further refinement of the standard parallel algorithm was developed. This new algorithm estimated the boundary areas (which we need to communicate) using the iterative solver, but after each iteration of the iterative solver in which an estimation is made, those boundary areas are fixed for a set number of following iterations. This method proved its worth as it outperformed the standard parallelisation method.